The DCO Computer Cluster provides DCO scientists with state-of-the-art computer power for performing a wide range of calculations. 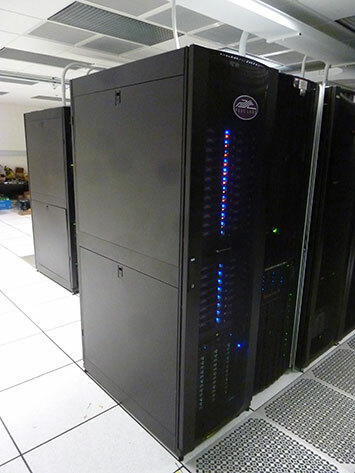 Now installed at Rensselaer Polytechnic Institute in Troy, NY, USA, the Deep Carbon Observatory (DCO) Computer Cluster comprises a PSSC Labs PowerWulf MMx Cluster with 640 Intel® Xeon® 2.4 GHz Compute Processor Cores and 544GB System Memory - 1GB Memory Per Compute Processor Core. The cluster (accessed via deepcarbon.rpi.edu) has 154TB of System Storage, a high-speed internal InfiniBand network, and a fast backup system. Providing all DCO Communities with state-of-the-art computer power for performing a wide range of calculations, the Linux cluster can run a variety of scientific programs aimed at modeling chemical and physical processes in deep Earth and carrying out data analyses. The cluster is currently managed by a team of DCO representatives under the technical guidance of Peter Fox, the DCO Data Science Team Leader, with scientific oversight from the Extreme Physics and Chemistry Community (EPC). Access to the cluster is available to all DCO researchers, and time can be requested by emailing Peter Fox (pfox@cs.rpi.edu) and Giulia Galli (gagalli@ucdavis.edu), with copy to EPC chairs Craig Manning (manning@ess.ucla.edu) and Wendy Mao (wmao@stanford.edu). The email should request the number of core hours over a specified period of time and provide a short justification for the requested time and the DCO program for which the time will be used (download this form for application details). Submit requests for allocations by 15 December 2013 (first batch) for resources allocated by 1 January 2014, and then by 15 May 2014 (second batch) for resources allocated by 1 June 2014. Additional requests outside these two dates may be accommodated if core hours are available. Questions about the DCO Computer Cluster may be directed to computer_request@deepcarbon.net. Photo: The DCO Computer Cluster installed and operational in the Research Computing Facility in the Center for Industrial Innovation at Rensselaer Polytechnic Institute's Troy, New York, campus. Courtesy of Peter Fox.